Definition at line 579 of file llmenugl.h. Definition at line 1202 of file llmenugl.cpp. References FALSE, mBranch, LLMenuGL::setParentMenuItem(), and LLMenuGL::setVisible(). Definition at line 1266 of file llmenugl.cpp. References LLMenuItemGL::addToAcceleratorList(), FALSE, LLMenuGL::getItem(), LLMenuGL::getItemCount(), and mBranch. Definition at line 1283 of file llmenugl.cpp. References LLMenuItemGL::appendAcceleratorString(), BRANCH_SUFFIX, LLUIString::clear(), LLMenuItemGL::mDrawAccelLabel, and LLMenuItemGL::mDrawBranchLabel. Definition at line 1293 of file llmenugl.cpp. References LLMenuGL::getHighlightedItem(), LLMenuGL::getKeyboardMode(), LLMenuGL::highlightNextItem(), mBranch, NULL, and openMenu(). Referenced by LLMenuItemBranchDownGL::handleKeyHere(), LLMenuItemBranchDownGL::handleMouseDown(), and handleMouseUp(). Definition at line 1388 of file llmenugl.cpp. References LLMenuItemGL::draw(), LLMenuGL::getTornOff(), LLView::getVisible(), mBranch, setHighlight(), and TRUE. Definition at line 622 of file llmenugl.h. Definition at line 1212 of file llmenugl.cpp. References LLView::getChildByName(), LLView::getName(), and mBranch. Definition at line 591 of file llmenugl.h. Definition at line 1227 of file llmenugl.cpp. Definition at line 1222 of file llmenugl.cpp. Definition at line 1253 of file llmenugl.cpp. References LLMenuItemGL::getXML(), LLMenuGL::getXML(), and mBranch. Definition at line 1247 of file llmenugl.cpp. Definition at line 1305 of file llmenugl.cpp. References FALSE, LLMenuItemGL::handleKey(), LLMenuGL::handleKey(), and mBranch. Definition at line 1427 of file llmenugl.cpp. References LLMenuGL::clearHoverItem(), FALSE, LLView::getEnabled(), LLMenuItemGL::getHighlight(), LLMenuGL::getHighlightedItem(), LLMenuItemGL::getMenu(), LLView::getParent(), LLMenuGL::getTornOff(), LLView::getVisible(), LLMenuItemGL::handleKeyHere(), LLMenuGL::highlightNextItem(), isOpen(), KEY_LEFT, KEY_RIGHT, mBranch, NULL, LLMenuGL::setKeyboardMode(), and TRUE. Definition at line 1233 of file llmenugl.cpp. References doIt(), FALSE, make_ui_sound(), LLView::mEnabled, LLMenuGL::setKeyboardMode(), and TRUE. Definition at line 1321 of file llmenugl.cpp. 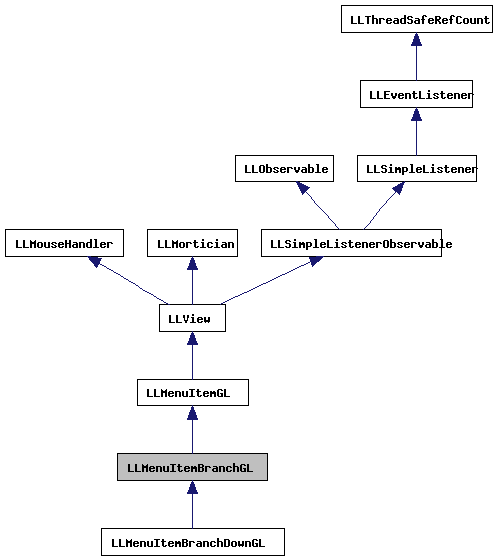 References FALSE, LLView::handleUnicodeChar(), mBranch, and TRUE. Definition at line 1399 of file llmenugl.cpp. References LLMenuGL::getHighlightedItem(), isOpen(), and mBranch. Definition at line 1404 of file llmenugl.cpp. Referenced by handleKeyHere(), LLMenuItemBranchDownGL::isActive(), and isActive(). Definition at line 1418 of file llmenugl.cpp. References FALSE, LLMenuGL::getTornOff(), mBranch, LLView::onVisibilityChange(), and LLMenuGL::setVisible(). Definition at line 1464 of file llmenugl.cpp. References LLMenuGL::arrange(), LLFloaterView::bringToFront(), LLMenuGL::getCanTearOff(), LLRectBase< Type >::getHeight(), LLView::getParent(), LLView::getRect(), LLMenuGL::getTornOff(), LLView::getVisible(), LLRectBase< Type >::getWidth(), gFloaterView, LLMenuGL::highlightNextItem(), left, llmax(), LLView::localPointToOtherView(), LLRectBase< Type >::mBottom, mBranch, LLView::mRect, LLRectBase< Type >::mRight, LLRectBase< Type >::mTop, NULL, S32, LLRectBase< Type >::setLeftTopAndSize(), LLView::setRect(), LLMenuGL::setVisible(), LLMenuGL::sMenuContainer, TEAROFF_SEPARATOR_HEIGHT_PIXELS, top, LLView::translate(), LLRectBase< Type >::translate(), TRUE, x, and y.
Referenced by doIt(), and setHighlight(). Definition at line 1383 of file llmenugl.cpp. Definition at line 1339 of file llmenugl.cpp. References LLMenuGL::clearHoverItem(), FALSE, LLMenuItemGL::getHighlight(), LLMenuItemGL::getMenu(), LLView::getParent(), LLMenuGL::getTornOff(), LLView::getVisible(), mBranch, LLView::mEnabled, LLMenuItemGL::mHighlight, openMenu(), and LLMenuGL::setVisible(). Definition at line 1409 of file llmenugl.cpp. References LLView::getParent(), mBranch, NULL, and LLMenuGL::updateParent(). Definition at line 582 of file llmenugl.h. 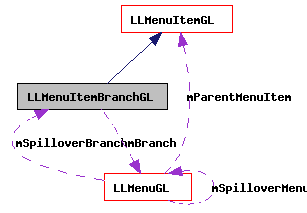 Referenced by addToAcceleratorList(), doIt(), LLMenuItemBranchDownGL::draw(), draw(), getBranch(), getChildByName(), getXML(), LLMenuItemBranchDownGL::handleAcceleratorKey(), handleAcceleratorKey(), handleKey(), LLMenuItemBranchDownGL::handleKeyHere(), handleKeyHere(), handleUnicodeChar(), isActive(), isOpen(), LLMenuItemBranchGL(), onVisibilityChange(), LLMenuItemBranchDownGL::openMenu(), openMenu(), setEnabledSubMenus(), LLMenuItemBranchDownGL::setHighlight(), setHighlight(), and updateBranchParent().